Side sleepers: Listen up. The Beyond Down Gel Fiber Side Sleeper pillow has “side sleeper” in its name, meaning it is specifically designed for people who (surprise!) sleep on their side. 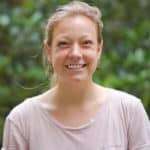 If that’s you, this means you need a pillow that is typically firm and thick to fill the space between the mattress and your neck while properly supporting your spine alignment. 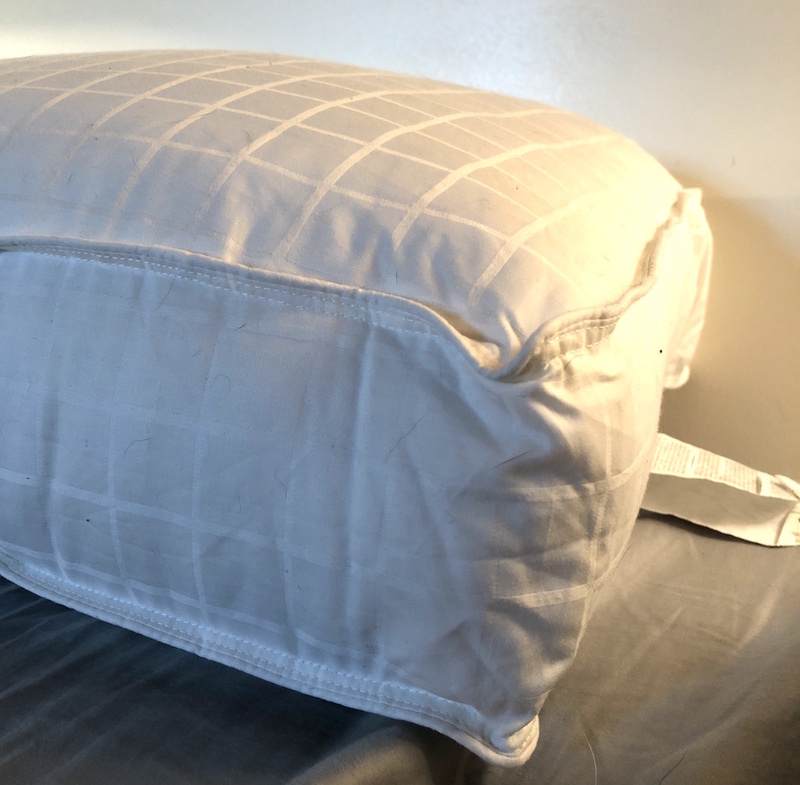 In addition to being built for side sleepers (we’ll get into that more below), this pillow is filled with micro denier gel fiber that mimics goose down, meaning you can get a taste of a luxury product without the price tag and avoid an allergy issues that could occur if you sleep on real down feathers. 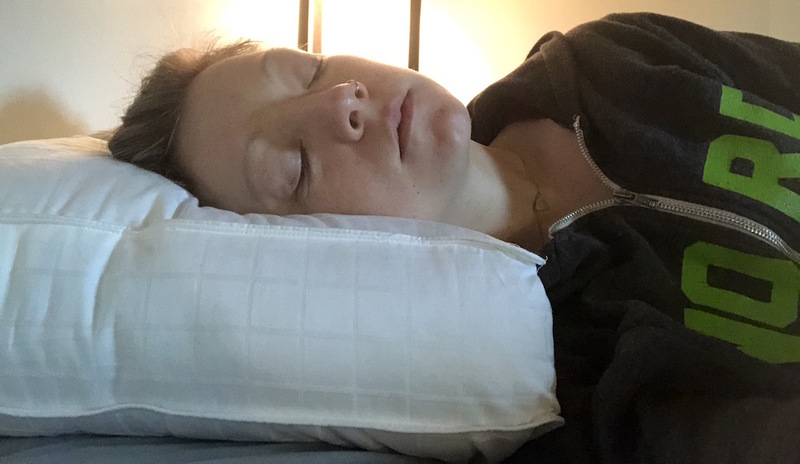 I am a side sleeper myself, so I was interested to see how the pillow would fare, and if the gel filling did truly feel like down while giving my head and neck the support it needs. Continue reading for the whole story, or scroll to the bottom for a handy summary. Built with thick down alternative, the Beyond Down pillow is ideal for back and side sleepers. In addition to the gel fiber fill, there is a gusset (an extra piece of material that gives a pillow extra, boxy structure) that is crafted with double needle corded edges and made to help with loft and lift—another good sign for side sleepers! As far as the cover goes, it’s made with 300 thread count, 100% cotton, and is threaded with a square weave to add an extra smidge of body to the pillow. I can testify that the cover is pretty soft! I’d give it a 7 out of 10 (with 10 being the softest thing imaginable). At first touch, this pillow really does feel like down—you can scrunch it up or fold it down, and it won’t bunch—rather, it will retain its shape. 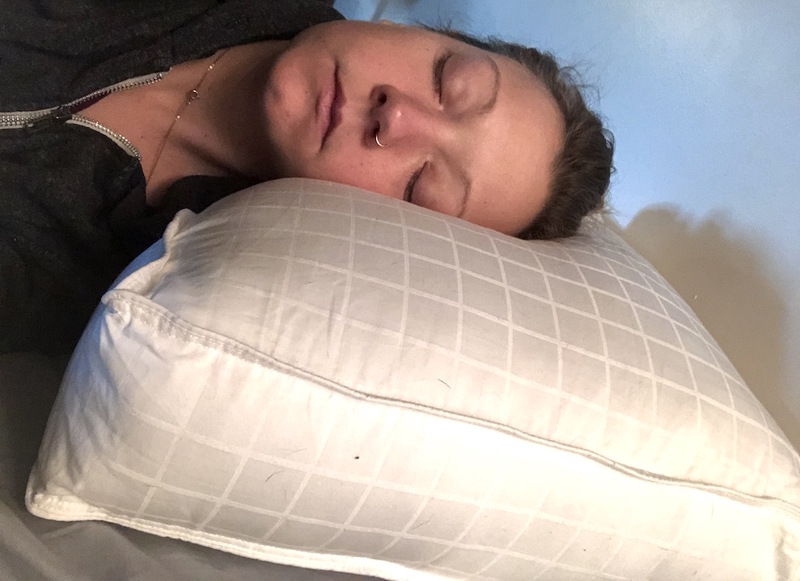 Additionally, it’s both hypoallergenic and machine washable, so there’s nothing you need to worry about when it comes to maintaining your own health, or the health of your pillow. However, I was disappointed to discover it didn’t support my neck the way I wanted. 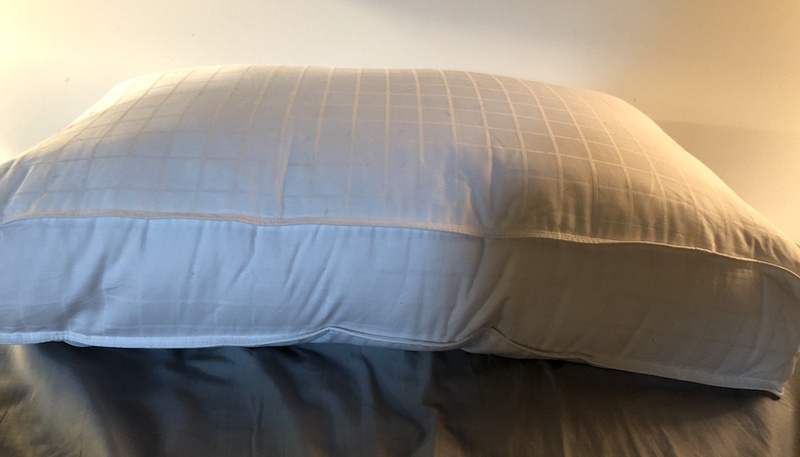 When I went to bed, I noticed right away that this pillow is really soft, but up to the point where it felt like it was flattening out. Even with the gusset, I didn’t feel like I had the neck support I needed. I plumped the pillow around, and while it didn’t bunch or flatten when I was using my hand, my head was a different story. It couldn’t fully support the weight of my head and I felt a large lack of support across the backside of my body. I woke up the next morning having tossed and turned a few times throughout the night. My neck was also a little stiff and my shoulders were sore. Essentially, I don’t think this pillow is a good option for side sleepers. Unfortunately, the gusset just doesn’t do enough to give side sleepers enough firm support to cradle our heads, necks, and spine. However—if you are someone who sleeps on their stomach, I do think this would be a good option for you. It’s soft and squishy, and does a good job of feeling like down. 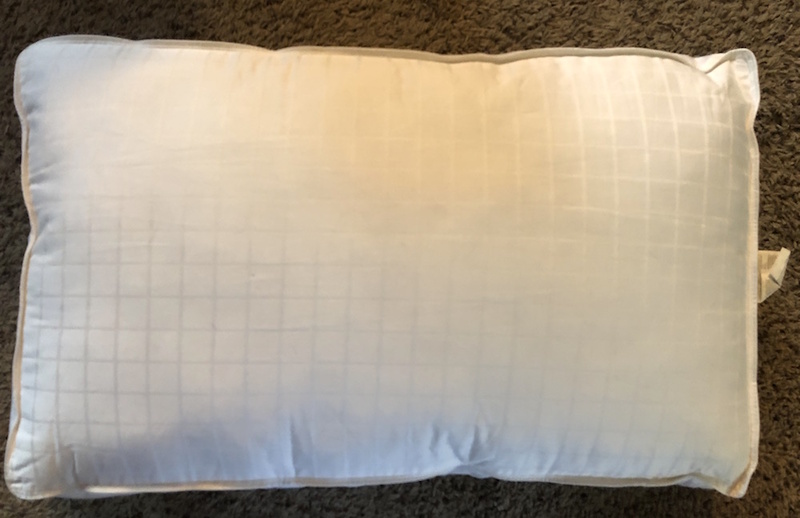 Unlike other standard pillows that typically have 60-65% 5-star reviews (or higher), I was surprised to see only 50% of the Beyond Down pillow reviews to have a 5 star rating.This raised an interesting flag right away. Those who had less than stellar things to say raised issues similar to what I experienced: it flattens out. You sleep on your stomach – While this pillow is advertised for side sleepers, it is just too soft, and is susceptible to flattening out. 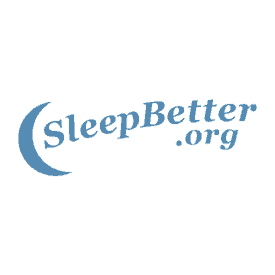 That said, softer and less firm pillows are typically great options for stomach sleepers, and with a pretty low price tag, could be a low-risk pillow purchase! You want to try something that mimics down – Even with less support, this pillow does a good job at mimicking down fill. If you’re curious about investing in a higher end down pillow, the Beyond Down is a good first step to seeing if this kind of filling works for you. You’re on a budget – You can purchase a Standard pillow for just $24.50, making it a great option if you don’t want to empty your wallet when buying your next pillow.